After 14 NHL seasons and 907 career regular-season games with five different organizations, the 36-year-old Pittsburgh Penguins defenceman made his postseason debut last Wednesday evening. So far, so good for Ron Hainsey in his Stanley Cup playoff career. Hainsey and the Penguins have defeated the Columbus Blue Jackets three games in a row. The dependable defenceman has chipped an assist, averaged 20 minutes and 36 seconds of ice time, helped the penalty-killing unit go 5-for-6 and he has blocked seven shots. Before the game reporters surrounded his stall in the Penguins dressing room because they wanted to know how he felt before his first Stanley Cup playoff outing. “It feels like a Wednesday,” Hainsey stated with a sardonic tone. He is known for his sarcastic sense of humour, and setting the record for the most regular-season games played before suiting up for a playoff game hasn’t been his favourite subject to discuss. But when the Penguins acquired Hainsey from the Carolina Hurricanes on Feb. 23, the 6-foot-3, 210 defenceman knew his lengthy wait to perform in the playoffs would soon be over. "You've got to play what is in front of you," Hainsey said. "I certainly would have loved to play 100 playoff games by now, won three Stanley Cups, but it just hasn't been the way it has worked out for me. This opportunity, these next couple of months, hopefully, we can string together a good run in what would be another championship run for these guys and first run like this for me. That is the focus. Hainsey has fit in nicely with the Penguins. He’s a leader, a character that keeps his teammates in good humour. "He's played for a long time, I'm sure he's excited," Pittsburgh captain Sidney Crosby told reporters before the series opener. "We're all excited, but it’s kind of a cool story to play that long and not play a playoff game. It tells you that it's not easy. You want to make the most of the opportunities you get." Hainsey was raised in a hockey-loving family in Bolton, Connecticut, just outside of Hartford. He knows all about the Brass Bonanza and the Hartford Whalers because his grandparents had Whalers season tickets. He played for the late Gary Dineen and his famed Junior Whalers program (now called the New England Coyotes) that also produced standout players like Bill Guerin, Scott Lachance and Mike Komisarek. Guerin just happens to be the current Penguins associate general manager and played a part in Pittsburgh trading for Hainsey. Dineen, a Montreal native, played six years for Father David Bauer and the Canadian national team. When Dineen turned pro he won the AHL 1970-71 Calder Cup championship with the Springfield Kings, but his career was cut short because of knee injuries. So Dineen started his junior program with the knowledge he gained from Father David Bauer. Hainsey graduated from Dineen’s program, played a couple of years with the United States national development team program in Ann Arbor, Michigan before he accepted a scholarship to the University of Massachusetts-Lowell. After his freshman season at UMass-Lowell, the Montreal Canadiens selected him in the first round (13th overall). He turned pro after two years of college hockey. Hainsey got quite a kick playing for the Canadiens AHL affiliates in Quebec City and Hamilton because he had an opportunity to return to play against the Hartford Wolf Pack at the Hartford Civic Center, where the Whalers played before they became the Carolina Hurricanes. Hainsey has experienced playoff hockey in June. He and the Hamilton Bulldogs advanced all the way to Game 7 of the 2002-03 Calder Cup final, only to lose in the deciding game to the Houston Aeros. It also was the season he played in his first game – 21 in total that year – for the Canadiens. But after parts of the next two seasons in the Montreal organization, the Blue Jackets plucked him off waivers. He then made stops in Atlanta, which moved to Winnipeg, and then he signed with Carolina (the old Whalers team) before his move to Pittsburgh. His last playoff game was with the Bulldogs in Hamilton on April 26, 2005, when the Rochester Americans swept the Bulldogs were swept in the first round. 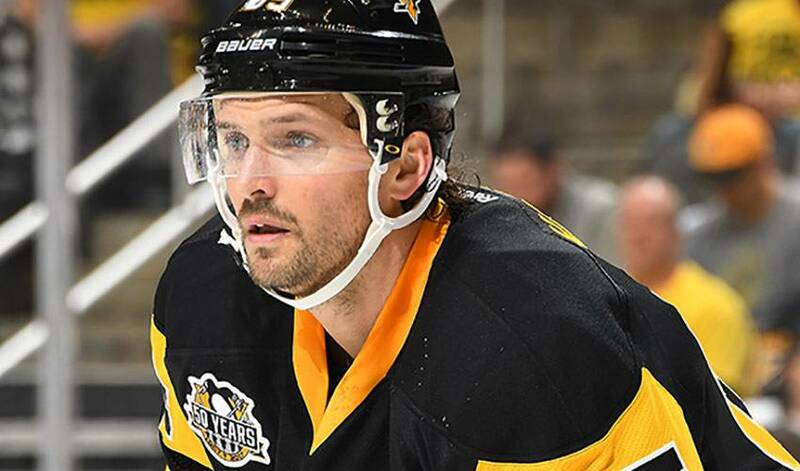 There was a visit with the United States team that competed in the 2009 IIHF World Championship, but now hockey in springtime takes on a whole different meaning for Hainsey.